I want to note that I was sent the retailer version of the game. Some of you might’ve gotten the Kickstarter variant. So your edition might vary slightly from mine in terms of components. 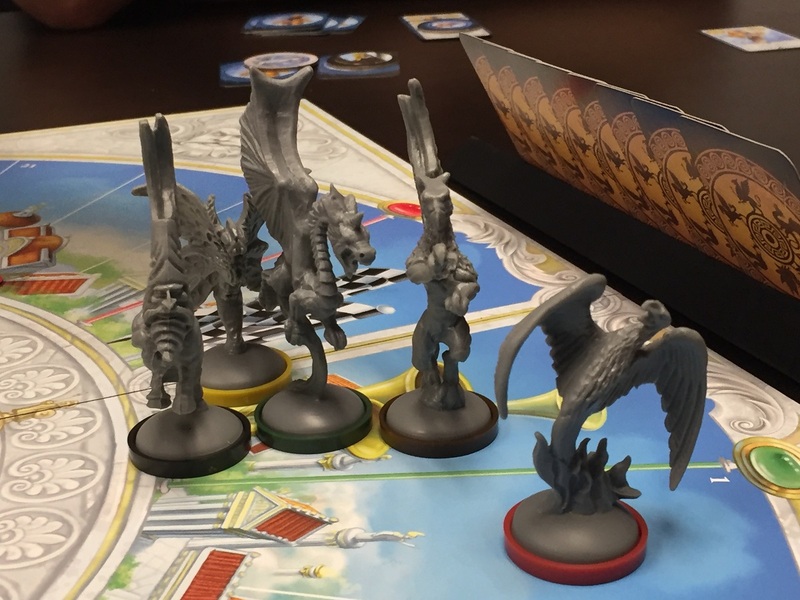 In the game, players take on the role of deities, seated around the track, ready to watch a set of races between mythological creatures. The setup begins with each player choosing a deity to represent and taking the corresponding bet cards, as well Power of the Gods cards (though those are only used in the advanced game), and the matching token. The board is set in the middle of the table so everyone can see it. The card holders are placed between each player, so that the two players can see what cards are on it. Shuffle together the Movement cards and deal out a certain number (depending on the amount of players) to each card holder. This means that players will get to see only a certain portion of the Movement cards available, and only see half the cards that their opponent can see. The Creature tokens are placed on the board in their appropriate spot. You will only use a certain amount of them, also based on the number of players in the game. 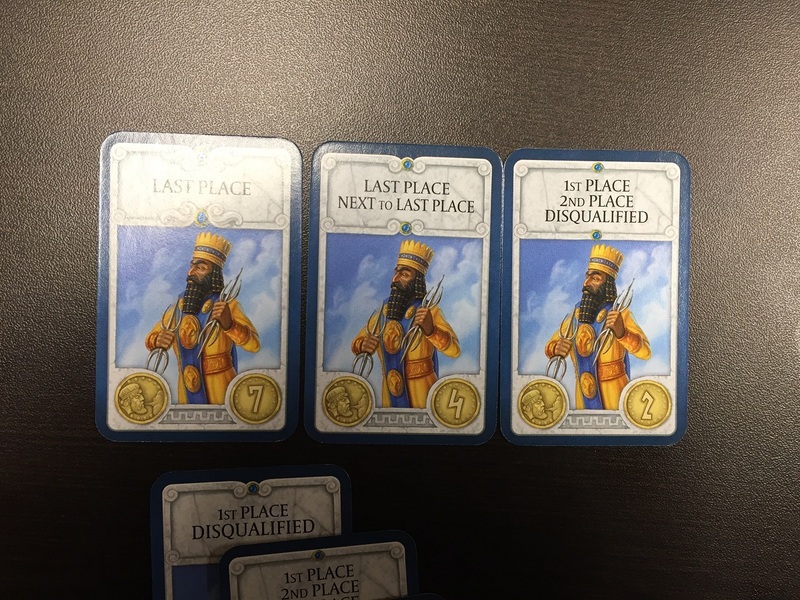 Take the four Zeus’ Judgement cards and put them on the board corresponding to the first race. 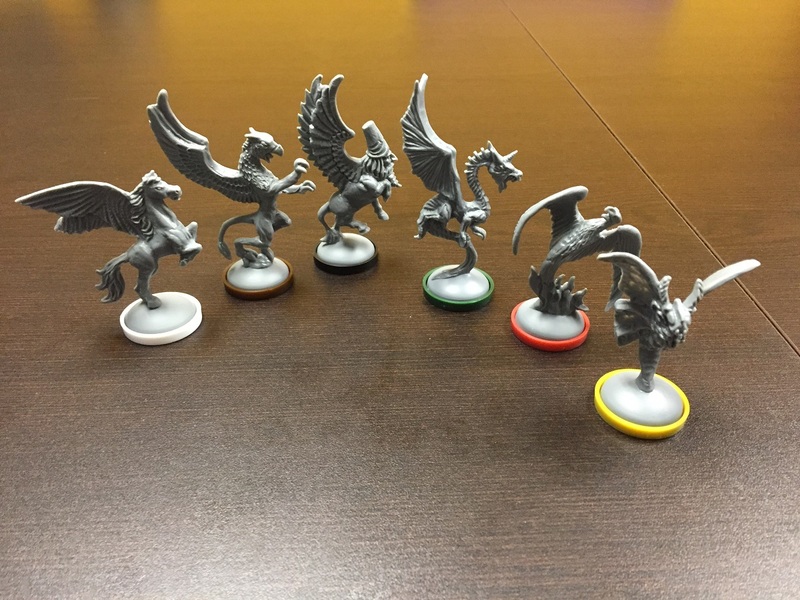 Place the appropriate base marker on the bottom of the different Creatures and place them all on the starting space on the board. Determine the first player by deciding who last saw a flying creature, and you’re all set to go. 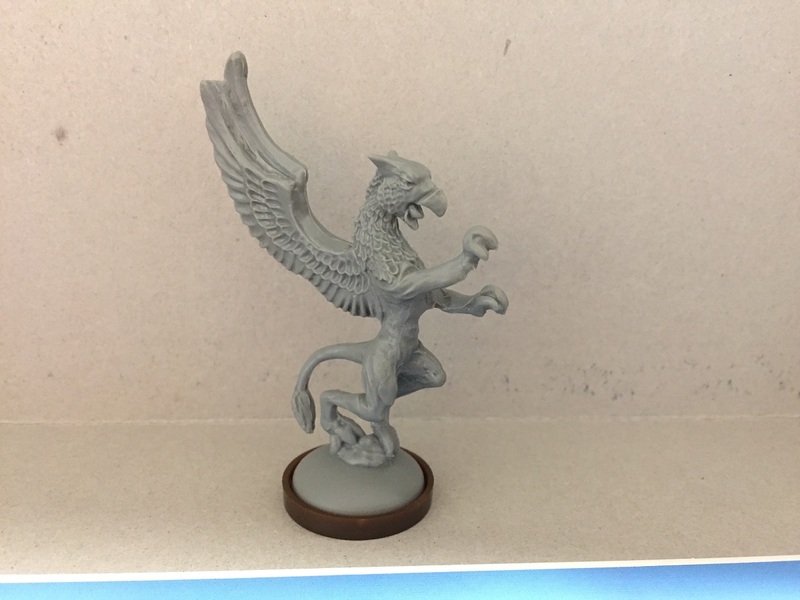 So, starting out, we should talk about the components for the game. There’s the game board, a punch-board of tokens, a big stack of cards, the card holders, and the Creature miniatures. 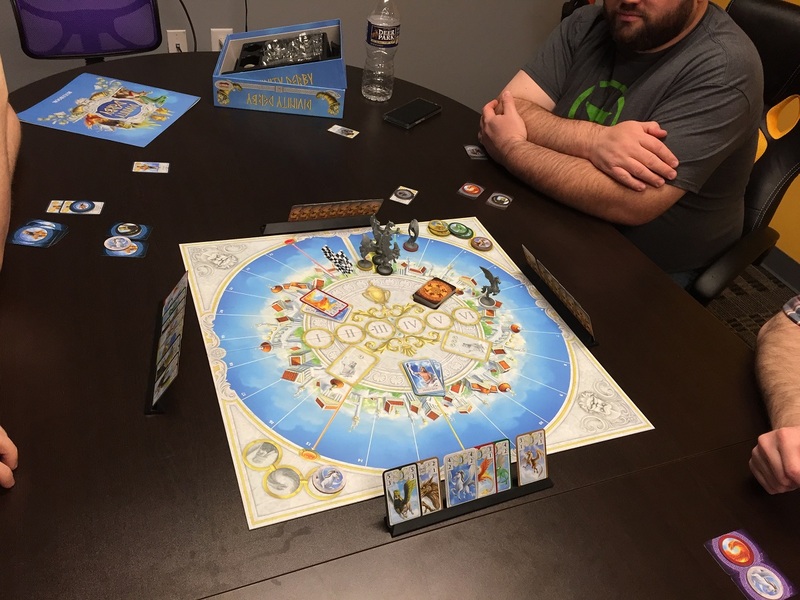 The board is a fairly standard game board. Bright colors, which is nice. The punch-boards all punched cleanly. No tearing on the paper when taking the various tokens off. Always happy to see that. The cards are “mini-card” size (think of something like Zombicide equipment cards or upgrade cards for X-Wing) and have a good feel to them and a good “snap” when flicked. The card holders are plastic and not too flexible. So, hopefully, they shouldn’t break. They’re not very wide, so cards will be overlapping a bit, but with how the information is printed on the cards, that’s not a problem. 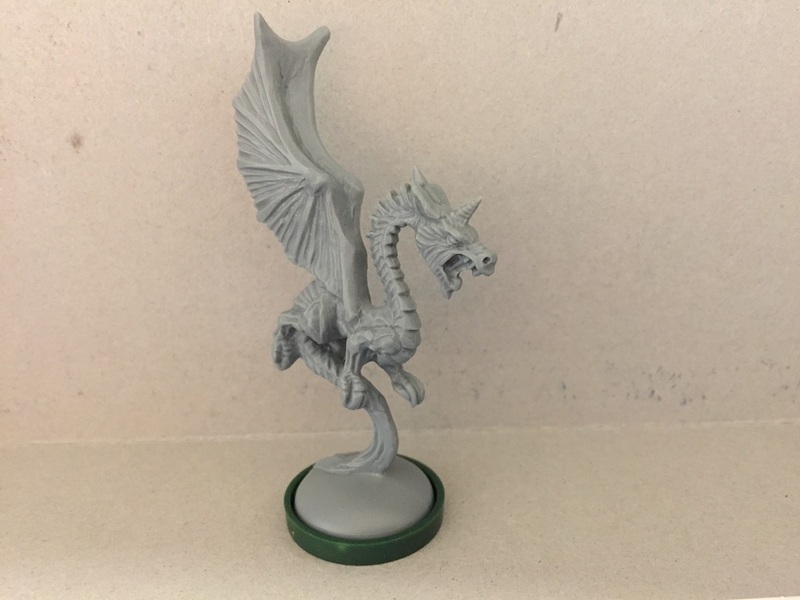 Last are the Creature miniatures. They feel like PVC and there are definitely some mold lines on them. One note is that they’re very two dimensional. Almost all the Creatures have their wings flat together, held straight out from their back. These, I feel, is a bit of a weak point in terms of production. 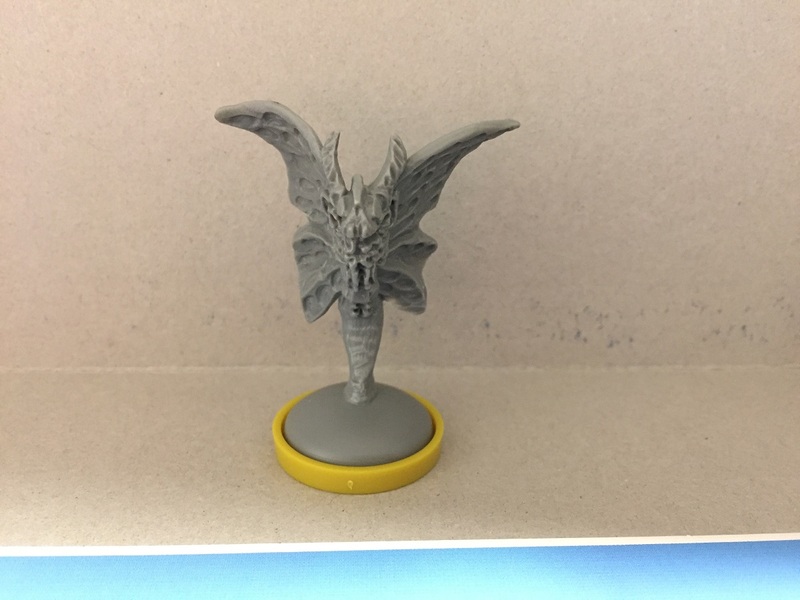 While not a real “miniatures board game” really, the figures are there to give some 3D to what could very easily be done via tokens (you even get Creature tokens to use in the game. One set could simply have a different color ring and be used on the board). So, a bit of a letdown there. 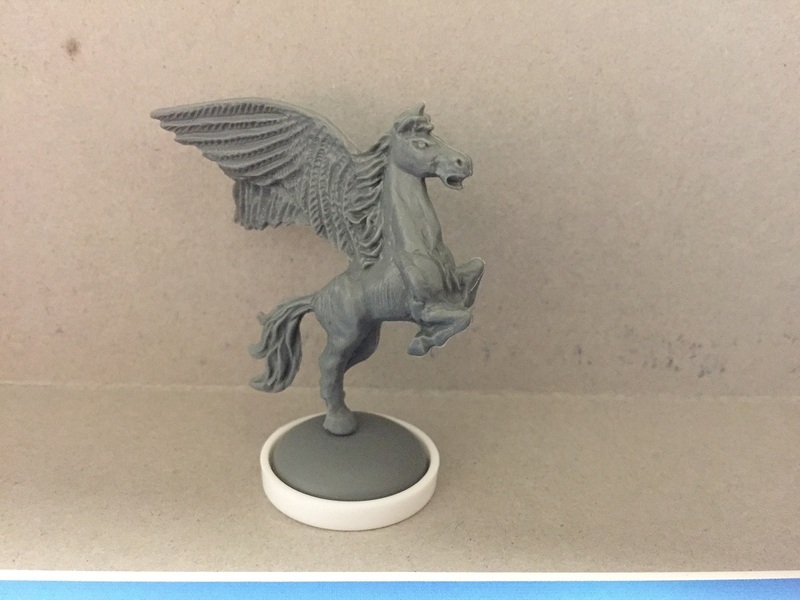 Players will score points in the game by successfully guessing what Creatures will finish in what places during three races. This is done by using the Bet cards that they have. Starting with the first player, everyone will take one of their Bet cards, which lists certain Places (or Disqualified) on it. The different places means a player think that a certain Creature will end the race in that spot. Using the information available via the Movement cards visible to them, the first player will take one of their Bet cards and place it, face down, on the table. They’ll then take one of the Creature tokens and place it on the back of the card. This means that they think that Creature will end in one of the places on the card’s front. Every player makes a first bet that way and then does it again. A player can only bet on each Creature once (so, for example, you can’t play two cards and have them both be for the dragon). Once everyone’s placed their 2nd bet, the race is ready to begin. The first player will be take one card from the card holder from their left and one from their right (you can’t take both from the same card holder). These Movement cards will then be used to move the Creatures on the board. The top number on the card is the Fast Movement number. The other is the Slow Movement number. 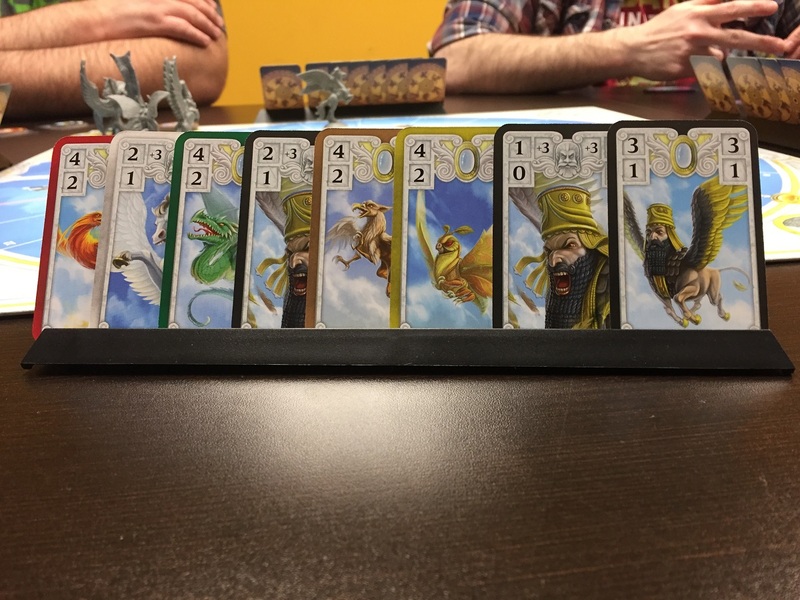 Each card is used for a specific Creature, as shown on the card (so, no moving the Pegasus with the Phoenix’s card). From there, it’s simply moving the Creature a number of spaces equal to the number on the card. Obviously, Fast Movement cards are faster than Slow Movement. Many of those are 0. It should be noted that, starting out, every Creature’s deck is identical. Where it gets interesting is that you’re not guaranteed to use every Movement card for a particular creature each race. When a Movement card is played, it is discarded. There’s also the Dirty Tricks cards. These cards have a Bonus Movement number on them, along with both Fast and Slow Movement numbers. You don’t have to use the Bonus Movement if you don’t want (you can just play the card regularly). However, you can add to the Creature’s Fast Movement value by using it (Dirty Tricks cards must be used first on a turn. So you can’t play two Dirty Tricks cards on the same turn. At least, not as Dirty Tricks). However, the gods aren’t fond of cheaters. Instead of being discarded, Dirty Tricks cards (only when used for their Dirty Tricks bonus) go onto the Zeus’ Judgement deck, started at the beginning of the race. Come on, Tinfoil! Deity needs a new pair of shoes! Halfway through the race, once the first Creature has made it past the mid-race line (which is different depending on the number of players), a 3rd round of betting takes place. 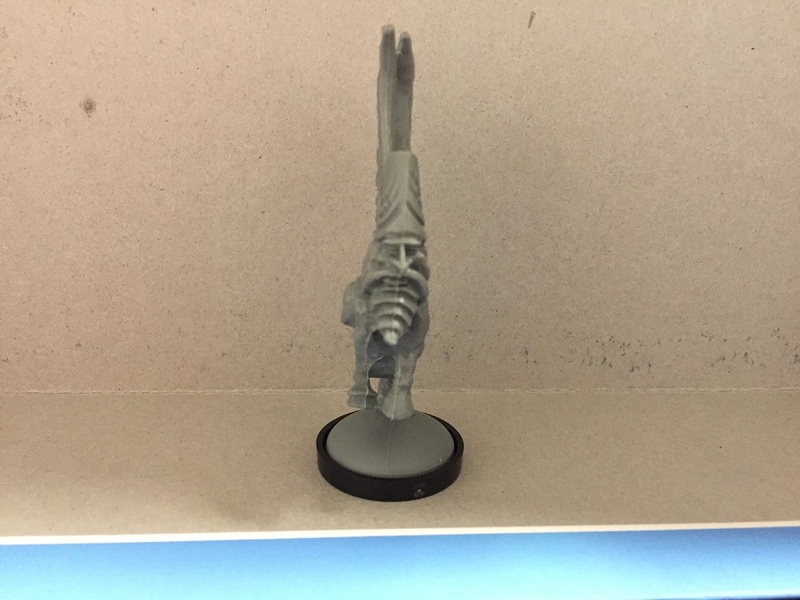 First, the First Player token moves to the player to the left of the one that just moved the Creature across the mid-race line (a small matter, but worth pointing out, as it can easily be forgotten). Then, the bets are placed. This works exactly like the first two, with players selecting one of their Bet cards and placing it, face down, in front of them with a Creature token on it. Once the last bets are placed, play goes back to the movement style. 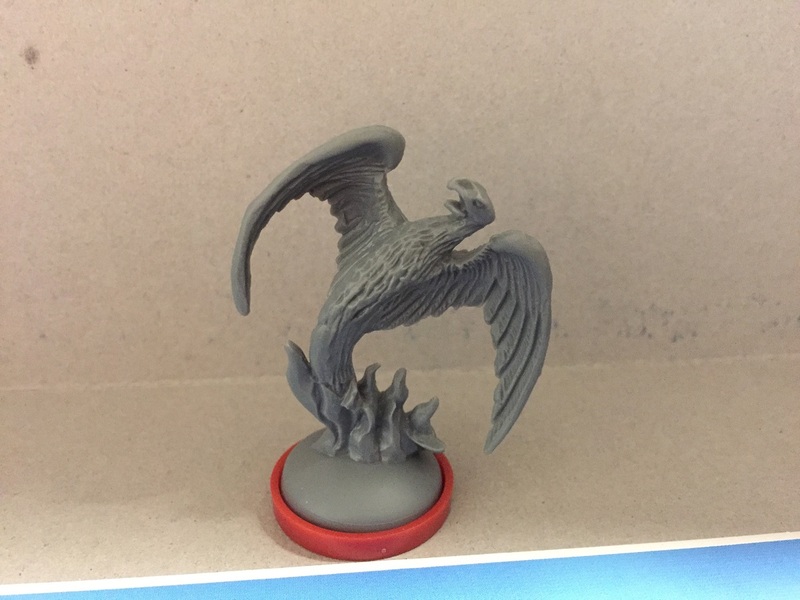 Players will use the now-dwindling cards on the card holders to continue moving Creatures. As they pass the finish line, they will be placed in the ranking section. If players run out of cards before a Creature makes it across, they’ll be placed in the ranking in proportion to how they are still on the board. You might think that it’s “The first one over the finish line wins,” but it’s not. You still have that Zeus’ Judgement to deal with. This deck is shuffled, including all the cards that had been used as Dirty Tricks. Then, two cards are drawn. 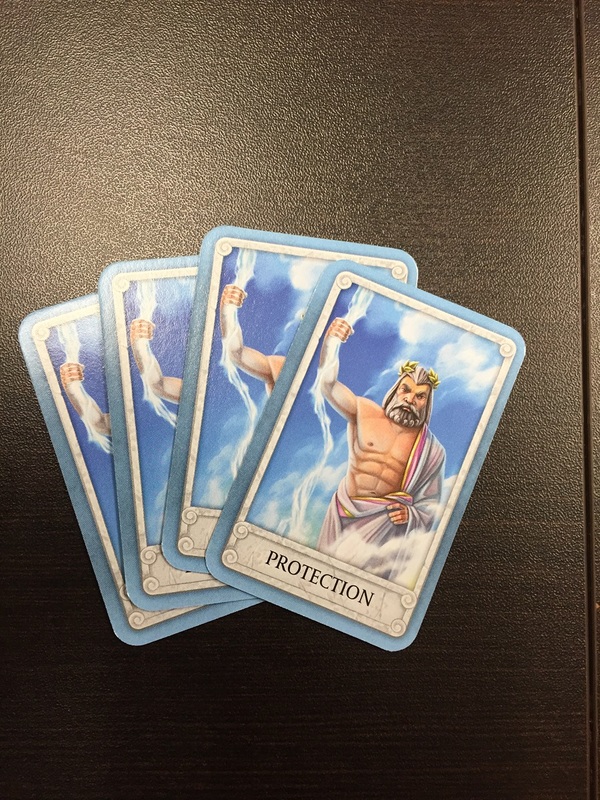 If they’re Zeus’ Protection cards, nothing happens. But, if they’re a Creature card, that Creature is disqualified and moved to the end of the ranking. Once that’s done, the actual final ranking can be determined. Simply slide up the remaining Creatures if any spaces are created by the disqualified Creatures leaving. Now that players know the final ranking of the Creatures, the Bet cards are revealed. Bets that were correct are placed under a player’s God token. If they were wrong, that card is placed in the Zeus’ Judgement space (where the Dirty Tricks cards had been for that race). Each Bet card has a Victory Point total on it. A player’s total Victory Points is the total on all the Bet cards under their God token. Getting ready for the next heat. 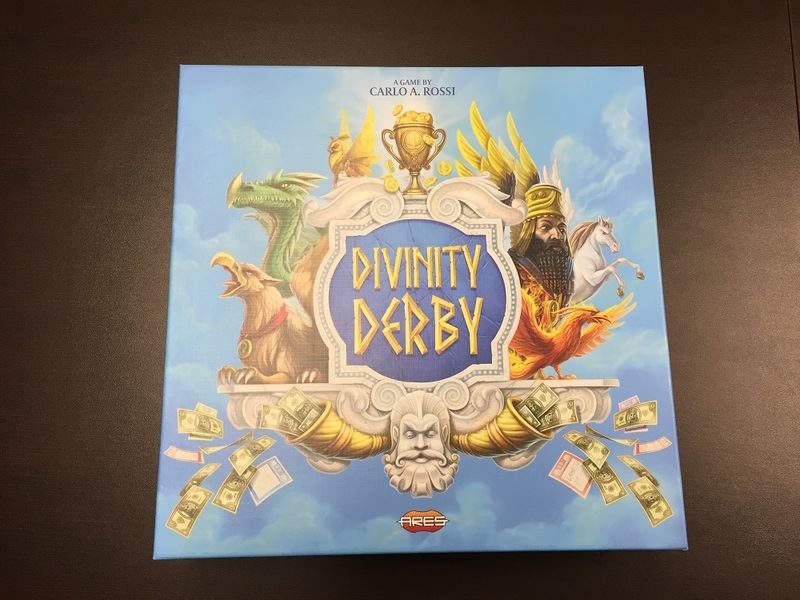 Divinity Derby is played over 3 races. For the 2nd race, the Movement cards are collected, shuffled, and distributed as before. Players place Bets like before, but they must pick from their remaining Bet cards. The Zeus’ Judgement cards are placed on the 2nd race space. Other than that, the race works exactly the same. For the 3rd race, there’s some small changes. No Zeus’ Protection cards are used. So if Dirty Tricks are played, someone’s getting DQ’ed. But other than that, the race works the same as the previous two. After the 3rd race is completed and Bets are checked, the player with the highest Victory Point total is the winner. The game includes several variants that you can use, if you choose. For example, there’s those Power of the Gods cards I’d mentioned before. Each one of those has its own special trigger and special power it does when played. They’re all unique, and each god has its own sort of “theme” for how they play. These also work in conjunction with the Fate tokens. 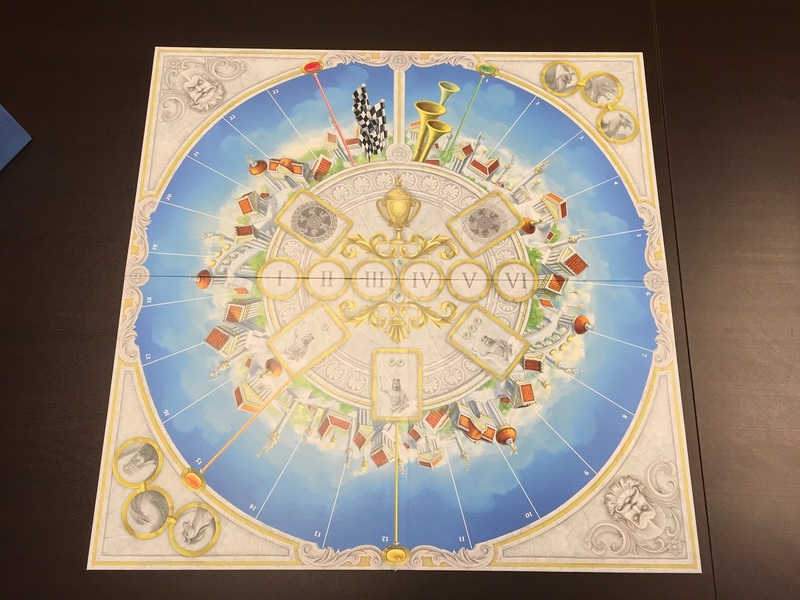 They are placed out onto the board at the start of the race and each has a special Power of the Gods card associated with it. So, when a Creature lands on the corresponding space, a player can play their special card then. Another alternate rule is that Zeus can slowly get sober as the races go on. 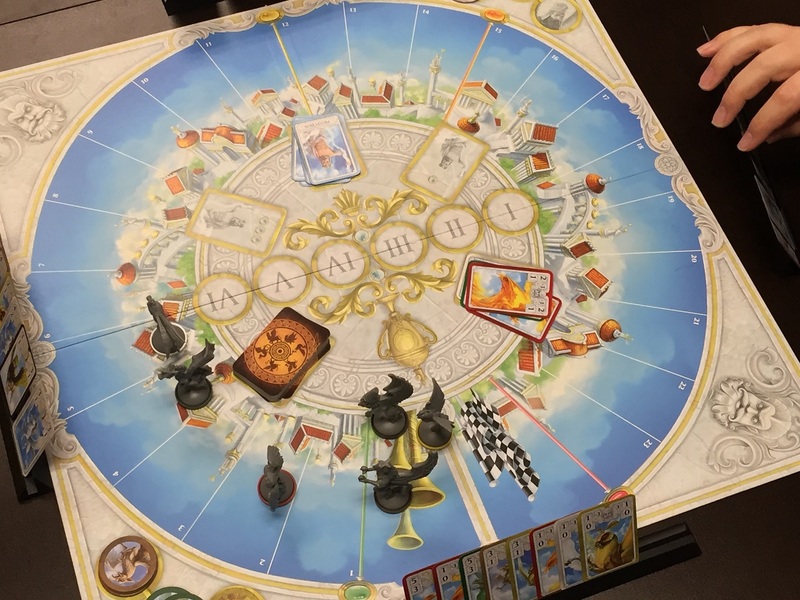 For the 2nd and 3rd race, instead of using the Zeus’ Protection cards as usual, players use only the ones left over from the previous race. So, since the game starts with 4, if 1 had been drawn in the first race, there would only be 3 left for the 2nd. As a fan of bluffing and hidden information games, I am a fan of several of the mechanics in Divinity Derby. I like the idea of sharing some information with your opponents, in the form of the shared card holders, but only sharing so much. And, obviously, there’s whatever you put down in Bet cards at the start. Sure, you’re trying to get a certain Creature across the line, but using so many Dirty Tricks, are you trying to actually get them disqualified or just in the winner’s circle? You won’t know until the end. With all the hidden information, it can be rough to form a winning strategy, though. You sort of have to rely a bit on your opponents to help your Creatures along. Good thing most of the Bet cards have a pretty wide number of places a Creature can end up to still get you points. The power of the Gods cards also help, as with so many races going on per game, it can feel a bit “samey” unless there’s a touch more thrown in, even with all the bluffing. One thing that happens apparently a lot is that you’ll run out of Movement cards before any Creature has crossed the finish line. We had entire games where nobody actually took the checkered flag. We simply ran out of cards and nobody was there yet. So we just had to use the farthest-along Creature as the winner. We double-checked the rulebook to make sure we were using the right number of Movement cards (since it varies by player count). It just really seemed odd that no Creatures would actually finish the race. 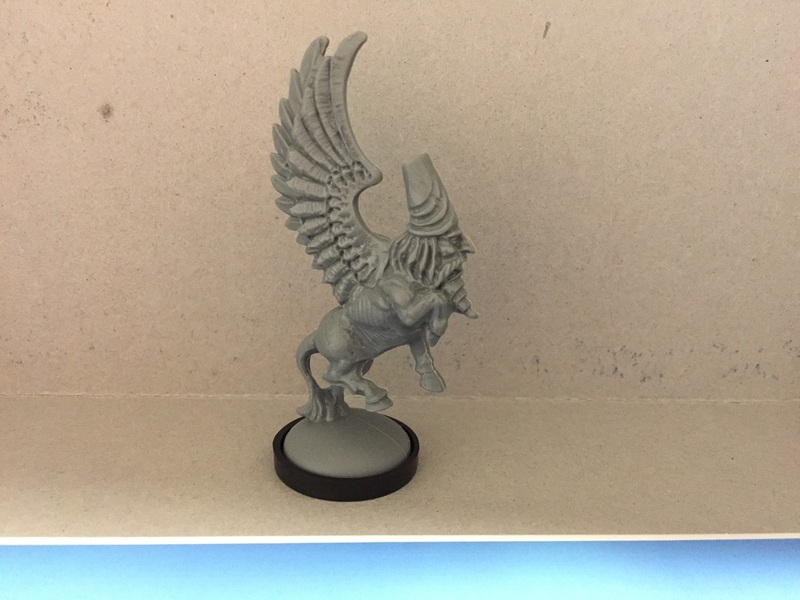 If you want to get your own arena and see which of these creatures is the fastest, can pick up your copy of Divinity Derby from your LGS today.